This is the first of the backwards give and go station drills. 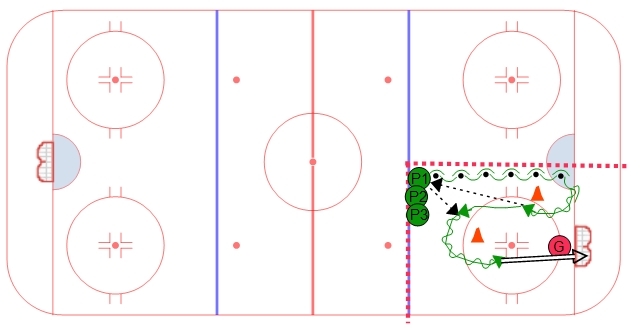 This is a good series for the younger ages because it can be set up in a small area of ice, in this case it only uses half of the offensive zone. Set up the drill as shown using two cones and the players lined up along the blue line with pucks. The first player starts backwards while handling a puck. At the cone they transition forwards while controlling the puck and make a pass to the next player in line. The next player in line give them a pass right back. The first player retrieves the puck and skates around the second cone before they take a shot on net. The second player starts the drill after they make the pass to the player in front of them.